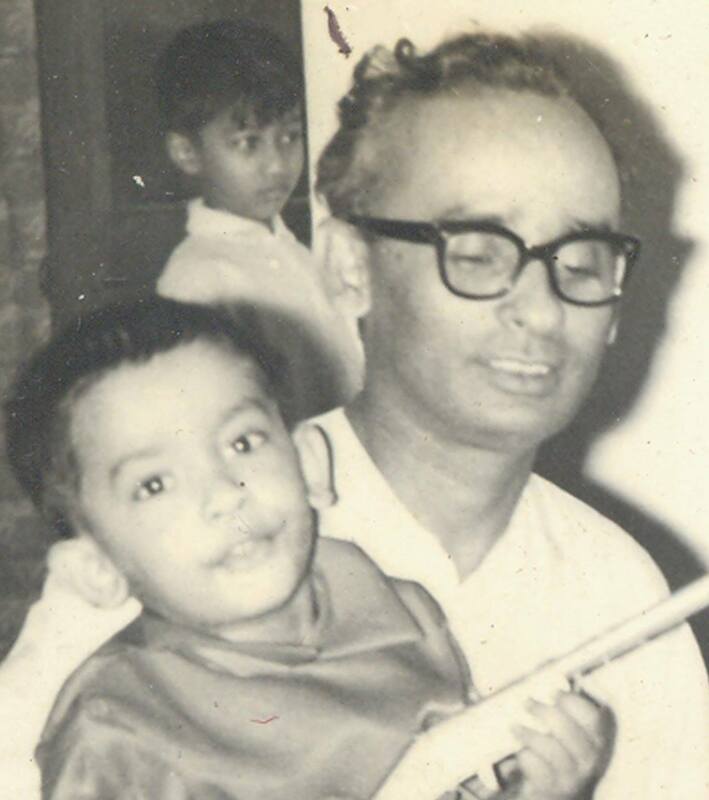 Tanvir Haider Chaudhury (age 3) with his father Prof. Mufazzal Haider Chaudhury. Source: Tanvir family album, with permission. This is the story of a holy man. He is a man of substance, someone who has made something of himself in this world. He left his homeland as a young man, leaving behind his career as a journalist in the erstwhile East Pakistan to gradually reinvent himself as a community activist and something of a spokesperson for those who subscribe to his particular brand of politicised religiosity in the far distant shores of the United Kingdom. It is hard not to admire the sheer feat of imagination it took for this man to achieve what he did. At the tender age of 23, he left the only home he had ever known for a place he possibly had no previous experience of and whose lifestyle and mores he would quite probably have been at odds with. Yet this young man made a mark on his adoptive country. At various times, he became a special editor of a weekly that preached the religious doctrine he held dear and a member of an organisation built around those beliefs. He went on to attain the position of Director of Spiritual Care Provision for people of his faith in the UK’s National Health Service, became a member of the Multi Faith Group for Healthcare Chaplaincy, and a chairman and later a trustee of the charity known as Muslim Aid. In short, he molded himself into a veritable pillar of his community. He is a man of strong beliefs and unshakable certitude, this holy man. When a writer, admittedly of some repute, became a little too big for his breeches and published a work of the imagination that some in his community perceived to be offensive, he was strident in his condemnations of this heretic and led the protest initiative. Around this same time, he helped to establish the Islamic Forum of Europe, an organsation whose views were perceived to be somewhat extreme by those lacking his staunch convictions in these matters. The organisation’s stated objective was to create a Sharia – Islamic jurisprudence – based state in Europe, so there may have been some basis to what those people of little faith were thinking. 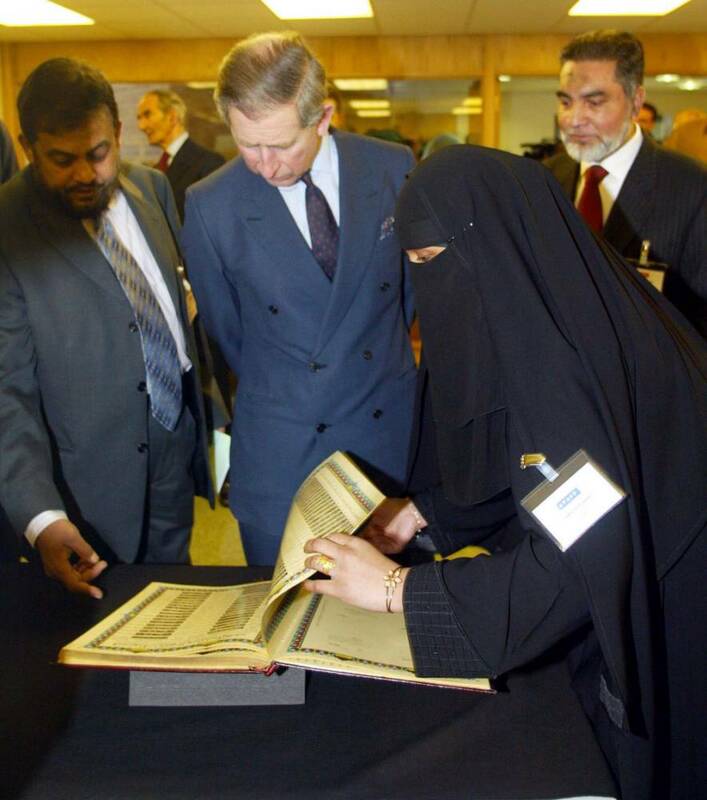 The Prince of Wales with Chowdhury Mueen Uddin (left) during a visit to the Markfield Islamic Foundation, Leicestershire, in 2003. Photo credit: Andrew Parsons/PA Wire. Be that as it may, our holy man has shaped himself into a person of imposing stature and substantial influence. He manages big budgets, vice-chairmans houses of worship, is a key figure in the education and proliferation of his distinct type of faith and hobnobs with princes – quite literally as in when his photograph was famously taken with the current Prince of Wales while inaugurating an extension of the house of worship he is the vice chairman of. An eminent individual. And, as the Islamic faith he subscribes to is avowedly a doctrine of equanimity, a man of peace, one would be forgiven for supposing. This is also the story of another man. This individual was not quite as dogmatic in his views as the first, not as quick to preach or to judge. In his own way, however, he was just as steadfast and committed as the other. His views were closest in nature to those of a secular humanist’s: he held that individuals had the capacity for self-realisation through pure reason. He did not reject religion; in fact, for most of his life, he was a practicing Muslim. He simply believed that religion was a personal matter that should not infringe on one’s public life. He also thought one’s cultural heritage was just as significant as any other aspect that contributed towards making up the self. Now this last belief is important because he lived through a period in history where in his homeland – again the erstwhile East Pakistan – the cultural and religious identities of most of his countrymen were seemingly at conflict with each other. This was the 1950’s; the so-called ‘Tomuddun’ movement was at its peak and a section of the local intelligentsia was proposing the creation of an East Pakistani literature that would contain no work by non-muslim, specifically hindu, authors. Some were going as far as to say it should contain nothing created before the partition of the subcontinent in 1947. This individual that we speak of was a scholar of Bangla language and literature and an acknowledged authority on the work of Rabindranath Tagore, the great Bengali poet and Nobel Laureate. While he did not have our holy man’s worldly connections and high office, he did possess an exceptional academic record and an incisive understanding of his roots. He instinctively spoke up against these hidebound sentiments. “If we left out everything that came before the partition”, he wrote, “some of the major works of Pakistan’s national poet Kazi Nazrul Islam would be lost, as well as the works of other ‘Tomudduni’ favourites like Golam Mustafa and Forrukh Ahmed.” He was scathing on the irony of celebrating Nazrul as Pakistan’s national poet and playing him up as a Muslim icon, when in fact the great man had celebrated all the great religions of his heritage, and indeed, the universality of the human experience. Now bear in mind that these words were written in the profoundly xenophobic and paranoid climate of the East Pakistan of the ’50s and the ’60s. You will have noticed that I speak of this second gentleman in the past tense. That is because he is no longer alive. He was murdered almost forty-three years ago. This man, this academician who was self-effacing as a person but forthright in his views of who and what his people were, was named Mufazzal Haider Chaudhury. He was a teacher of the Bangla department of (the erstwhile) Dacca University. He was also my father, whom I have not seen since I was four years old. The first man, the holy man who casts such such a large shadow in his adopted land, is Chowdhury Mueen Uddin, and he was responsible for my father’s death. He came in person to abduct my father and seventeen of his peers on December 14, 1971, just two days before East Pakistan became Bangladesh, at the culmination of a bloody nine-month liberation war. These individuals – nine teachers, six journalists, three doctors – were then taken to an isolated place where they were savagely tortured. An eyewitness, the only individual to have survived the incident, recounts that he saw individuals with eyes gouged out and the floor of the entire room awash with blood. My father and Munier Chowdhury, another eminent academician and a famous playwright, were beaten with iron rods. All of them were then taken out in the early hours of December 15 and bayonetted or shot to death. The reason that I am so unequivocal in my statement that Mr Mueen Uddin was part of the team of abductors is this: there were eyewitnesses. The abduction happened from the house of Lutful Haider Chaudhury, my father’s youngest brother. My father, my mother, my uncle and my aunt all recognised Mueen Uddin. In fact, Mueen Uddin offered words of reassurance to all of them, saying no harm would come to my father and he would be returned presently. 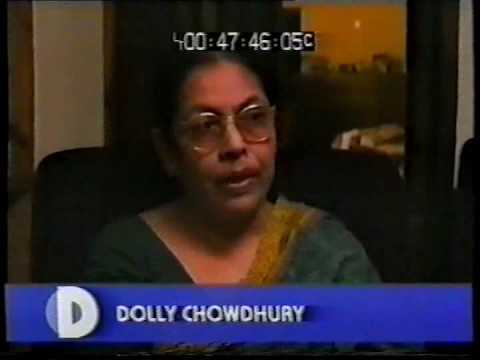 Dolly Chowdhury being interviewed in The War Crimes Files. You see, before he fled his home to become a holy man in the British Isles, Chowdhury Mueen Uddin was a student of my father’s at (the erstwhile) Dacca University. As a journalist, he worked with Ehtesham Haider Chaudhury, another brother of my father’s, at the Daily Purbodesh. The entire extended family knew him. My aunt Dolly Chaudhury, Lutful Haider Chaudhury’s wife, can be seen testifying to this effect in the documentary War Crimes Files, a British Channel 4 film made by the journalist David Bergman. My cousin Iftekhar Haider Chaudhury, who was then eight years old, narrated the entire abduction episode, including Mr Mueen Uddin’s involvement, in his testimony during Mueen Uddin’s trial in absentia at the International Crimes Tribunal in Bangladesh. Mr Mueen Uddin categorically denies all this, of course. He claims the abundant evidence against him has been put forward by people who are ‘misled by the media’. He keeps repeating this while there are eyewitnesses who relate his complicity. Captured members of the Al-Badr, the notorious paramilitary force comprised of local collaborators of the Pakistani army during the 1971 war, have stated that he was their operation in-charge. Mr Mueen Uddin still seeks to evade and deceive. Mr Mueen Uddin’s own editor at the Purbadesh during 1971, Atiqur Rahman, relates a story where he was asked for his home address by Mueen Uddin during those troubled times. Fearing that he too would be abducted, Mr Rahman supplied a false address. Mr Rahman’s name, complete with the fake address, appeared on an Al-Badr death list found just after the war. Mr Rahman is quite certain that he gave the address to nobody else. On November 3, 2013, the International Crimes Tribunal set up by the Government of Bangladesh to judge the crimes against humanity committed during the 1971 liberation war found Chowdhury Mueen Uddin guilty of the murder of eighteen teachers, journalists and doctors, and sentenced him, in absentia, to death. Mr Mueen Uddin is now a citizen of the United Kingdom, a country that does not have an extradition treaty with Bangladesh. A spokesperson of the UK High Commission in Bangladesh has also said that his country is opposed to “the application of the death penalty in all circumstances”. There seem to be exceptions to every rule, however. Abu Qatada al-Filistini, a Jordanian national of Palestinian origin who has been described as being affiliated with Al-Qaeda, was indeed deported to Jordan, a country that practices the death penalty, on July 7, 2013, after the UK and Jordanian governments agreed and ratified a treaty “satisfying the need for clarification” that evidence gained through torture would not be used against him in his trial. Now that sounds like a none-too-subtle threat to me. And not the words of a holy man. Not a man of peace after all.